I was recently astonished to discover that there is a crested and bald ibis, very similar to N. Bald Ibis and critically endangered at the same level, occurring in China! Only difference is the color, as the Chinese ibis is snowy white: this far oriental ibis species is actually like the “photographic negative” of the Northern Bald Ibis! The Crested Ibis Nipponia nippon, once spread across China, Russia and Japan, shares indeed a very similar story to that of Middle East N. Bald Ibis: in fact, seven individuals were discovered in a remote area of China in 1981, after it was believed the species had become extinct - same story and exactly same number of ibis survivors found in Syria! Why? 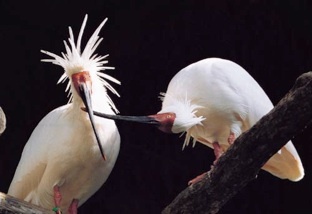 Because the behaviour of these 2 ibis species is very different: the Chinese ibis is resident while the middle eastern counterpart is a migratory bird. It is in fact much simpler trying to save a resident animal than another that move between 9 different countries twice during the course of one year! In fact, also the other cousins of Middle Eastern ibises, those living in Morocco and belonging to the same species, are resident: and again, their 20-year conservation saga has been quite successful so far. Another interesting point: ibis saga in the Middle East reminds conservation stories of other iconic birds taken place in the US. 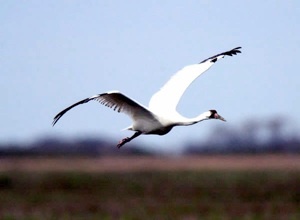 For instance, the amazing conservation saga of the Whooping Crane (Grus americana): when the saga started at the beginning of previous century, the situation was quite desperate, similarly than for the N. Bald Ibis in Syria: only a handful of individuals still surviving. The fact that these few survived individuals were migratory made the whole situation extremely difficult and complicated from a conservation point of view. It is indeed much simpler try to save a bird that is resident, like for instance the California Condor or the Chinese Crested Ibis. 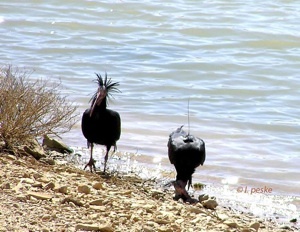 Also, the rediscovery in 2002 of the relict colony of N. Bald Ibis in Syria was in many aspects similar, at least in conservation importance, to the (still unconfirmed?) 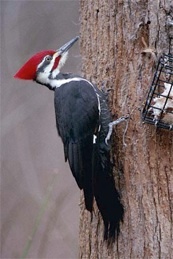 rediscovery of Ivory-billed Woodpecker (Campephilus principalis) in Arkansas in 2005. Due to elusiveness, both species managed incredibly to go unnoticed for decades - despite occurring in very anthropized countries.